Which of Michelle's boy دوستوں do آپ like better? Which of Michelle's girl دوستوں do آپ like better? Do آپ hate that DJ and Steve broke up in Season 7? What episode made آپ cry the most? What do آپ think happens next? 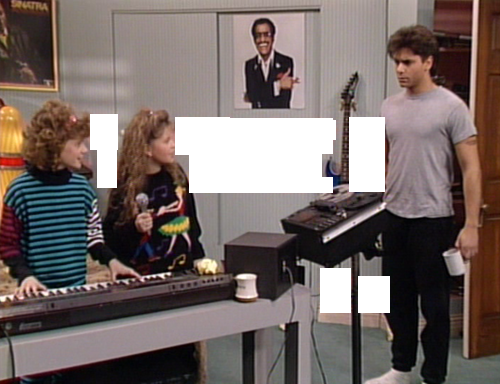 Full House is a مقبول sitcom that started in the 1980s and ended in the 1990s. The دکھائیں had a spin off named Fuller House. The دکھائیں has a big group of memorable and fun characters and this فہرست is about my سب, سب سے اوپر 5 favorites. Stephanie is the 2nd youngest of Danny Tanner's daughters. Since she's younger than D. J. she's مزید immature. Her sarcasm and wit are amusing. She's quite funny every time she says "How rude." D.J. ends up winning two free tickets to a ساحل سمندر, بیچ Boys کنسرٹ in a radio contest, but then has to make a decision consisting of who she brings with her (along with her best friend Kimmy Gibbler). She wishes she could take her family with her, but, according to the rules of the contest, she is allowed to bring only one guest. Jesse is shocked and excited when he discovers he has inherited The Smash Club from the late Buzz Markel, according to his will. Jesse and the Rippers played gigs at the Smash Club مزید than virtually any other band. However, the place has been closed down for the past couple of years. Jesse will become the owner only if he can reopen the club. If he can’t do it, the club will be turned into a parking lot. Joey has not yet found a تاریخ for New Year’s Eve. So, Danny and Jesse secretly videotape Joey and send the tape to a local video dating service. Joey’s تاریخ ends up being a woman named Christine, and he and Christine fall in love at first sight when they see that they have almost everything in common with each other. Joey wants to take Christine to Las Vegas and get married, but later realizes that they need to take the time to get to really know each other first (which is a good idea, of course). DJ Tanner: DJ is now 37. DJ works as a 5th grade teacher at Frasier سٹریٹ, گلی Elementary. She married Steve in 1998 and they have 3 daoughters, Abigail "Abby" born 2001, Emily born 2005 and Lilly born 2010. She and her family اقدام back into Danny's house. Stephanie Tanner: Steph is now 32. Stephanie works has a dance teacher. She got married in 2012. She is pregnet with her first baby. She is due to give birth اگلے month. It's a girl. She wants to name her Ashley. Jesse’s recording studio is used سے طرف کی “The Funky Tongues”, the hottest band in D.J.’s school. a poll گیا دیا کر شامل: Which of Michelle's boy دوستوں do آپ like better? a poll گیا دیا کر شامل: Which of Michelle's girl دوستوں do آپ like better? a pop quiz question گیا دیا کر شامل: Which musician was Jesse obsessed with? a pop quiz question گیا دیا کر شامل: Which sport did Stephanie play? What color were the bunny rabbits in Jesse's bedroom?